I so requested to buy Amazon Echo, which promises to bring Star Trek-like responsive computing to the home. The cylindrical device, announced today, is a Bluetooth- and WiFi-enabled speaker that responds to users' questions. Just say "Alexa" and ask something. "What's the weather?" "What is the largest dinosaur?" This is how search information should be, assuming Echo resounds as strongly as Amazon's product information and demo video claim. Touchless interaction is by no means new. Apple got the jump with personal assistant Siri, which responds to requests and commands on iOS devices. Google Now, available on multiple platforms, is far superior, and Windows Phone now has Cortana. All three cloud-based touchless-response systems make your voice the primary user interface. But Echo, like the Moto X smartphone, is always listening, such that the interaction is almost completely hands-free. That's the difference. If Apple had unveiled something like Echo, the blogosphere would boom with crazy praise for such innovation. There also would have been rumors galore beforehand. 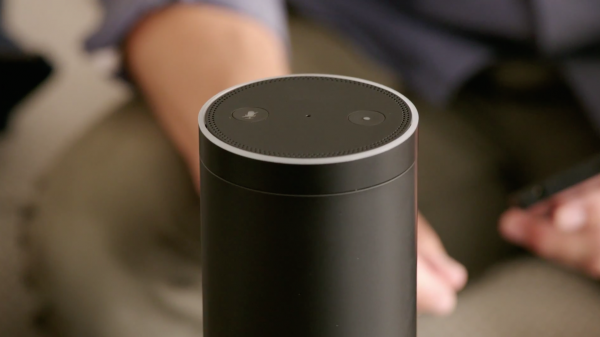 In typical Amazon fashion, Echo makes a rather quiet and unassuming debut. Meanwhile, bloggers utter a collective "Huh?" My book The Principles of Disruptive Design, which badly needs to be updated (sorry about that), puts touchless-interaction at the forefront of the next user interface evolution. I fault Apple for doing so much for touch but failing to transcend it. Nokia, inventor of the smartphone, had similar problem transitioning to touch, losing the category first to iOS and then also Android. The most successful companies, like the people who create them, share several common traits. One is consistent: The willingness to take risks. Great design, particularly for products that disrupt existing categories, or create new ones, is all about risk. True design genius brings to market something people don’t know they want, or even need. But seeing, they experience the Grok moment of realization. Risk defines Apple's approach to technology and user interfaces, going back to Macintosh 30 years ago. But the R word is something missing since Steve Jobs' death—actually since iPad's launch in Spring 2010. This is a super short list of risk-taking, disruptive decisions, and the majority offer something users wouldn't necessarily know they needed until seeing it. That measure is the truest definition of innovation. Echo looks promising. The concept is excellent, but the devil is in the details, which can't be evaluated without first using the device. I'm anxious to try.